Children from battle-torn Marawi City are set to meet with President Rodrigo Duterte on Tuesday afternoon in Malacanang. 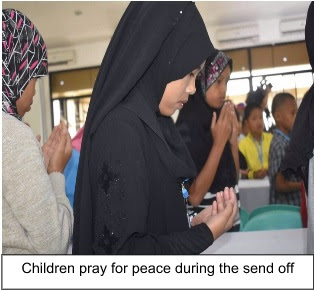 The children — 35 all in all, aged 7 to 13 years old — are part of the five-day “Tabak Educational Tour: Peaceful Environment for Marawi Children” by the Joint Task Force Marawi. They had a simple send off ceremony at the Lanao del Sur provincial Capitol on Monday morning. ZAMBOANGA CITY — The Joint Task Force Marawi is hosting a five-day educational tour for 35 children in Manila, a top military official announced Monday. Brig. Gen. Rolando Joselito Bautista, Joint Task Force Marawi commander, said the tour is from August 28, to Sept. 1, which kicked off with a simple send off ceremony at the Lanao del Sur provincial capitol. Dubbed as “Tabak Educational Tour: Peaceful Environment for Marawi Children,” the Manila tour is expected to provide the children-participants, who live in conflict-affected areas, with educational experience, social and cultural values for peace-building, and exposure to peaceful environments. Bautista said the participants, ranging from 7-13 years old, were identified as among those vulnerable and susceptible to violent extremism. “This is one of the initiatives of the armed forces to ensure that those children displaced by the crisis in Marawi City are given adequate support and psycho-social treatment by the government. It is imperative that at the initial stage, those deemed vulnerable are being guided and educated to know their roles in the mainstream society,” said Bautista, who is also the Army’s 1st Infantry Division. The Joint Task Force Marawi has tapped the assistance of the Lanao del Sur provincial government, Philippine National Police Women and Children Protection Desk, Department of Social Welfare and Development, Teach Peace Build Peace Movement, and the Kilos Kabataan Livelihood Foundation, Inc. to realize the educational tour project. The task force also coordinated with concerned government agencies, offices, and partners in Manila. 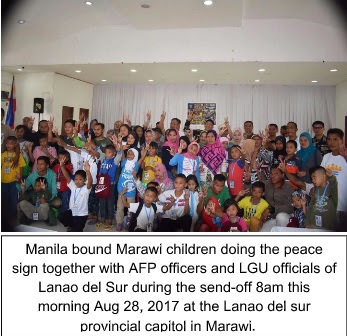 PAGADIAN CITY, Zamboanga del Sur (August 28, 2017) – Thirty-five (35) children from Marawi City will be taken on an educational tour by the Joint Task Force Marawi in Manila with a simple send off ceremony at the Lanao del Sur provincial Capitol 8am Monday (August 28), military official said. Western Mindanao Command (WestMinCom) spokesperson Cpt. Jo-Ann D. Petinglay disclosed that the five-day tour from Aug 28 to Sep 1 dubbed as “Tabak Educational Tour: Peaceful Environment for Marawi Children,” the Manila tour is expected to provide the 35 participants, who live in conflict-affected areas, with educational experience, social and cultural values for peace-building, and exposure to peaceful environments. The participants, ranging from 7-13 years old, were identified as among those vulnerable and susceptible to violent extremism. “This is one of the initiatives of the armed forces and to ensure that those children displaced by the crisis in Marawi City are given adequate support and psychosocial treatment by the government. It is imperative that at the initial stage, those deemed vulnerable are being guided and educated to know their roles in the mainstream society,” said Brig. Gen. Rolando Joselito Bautista, commander of the JTF Marawi and the 1st Infantry “Tabak” Division. Cpt. Petinglay said that it may be recalled that the DAESH inspired terrorists who attacked Marawi recruited and use child warriors in the main battle area and and are still recruiting minors until now. The provincial government of Lanao del Sur, the Philippine National Police Women and Children Protection Desk, the Department of Social Welfare and Development, the Teach Peace Build Peace Movement, and the Kilos Kabataan Livelihood Foundation, Inc. were tapped by the JTF Marawi to make this endeavor possible. The military also coordinated with concerned government agencies, offices, and partners in Manila, she added. 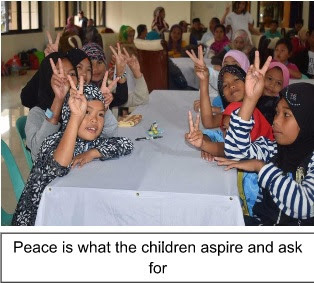 “Rather than hold guns and become combatants, we want these children to foster a sense of responsibility and, in the future, become leaders of a peaceful Marawi,” Brig. Gen. Bautista concluded. Kampo Ranao, Marawi City, August 25, 2017 – Recognizing that the ongoing Marawi Crisis perpetrated by terrorists resulted to the displacement of individuals affecting their physical, emotional, and psychological make-up, the Joint Task Force Marawi will conduct a socio-cultural tour with the theme: “Tabak Educational Tour: Peaceful Environment for Marawi Children” for selected children from Marawi City. In partnership with the Provincial Government of Lanao del Sur, Philippine National Police Women and Children Protection Desk, Department of Social Welfare and Development, Teach Peace Build Peace Movement, and Kilos Kabataan Livelihood Foundation, this educational tour is set to provide the participants who will be brought to selected locations in Manila with educational experiences including social and cultural values for peace building, away from their regular community and school environment; and to expose the them of peaceful environments outside their conflict affected area. 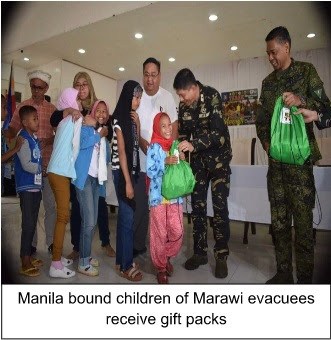 “This activity is part of the military’s soft power approach of as part of remedial measures to unwind the emotional, cognitive, and behavioral functioning of children away from conflict areas in Marawi City, this activity will be conducted to provide new experiences of seeing peaceful real-life application of the lessons they have learned in school,” Brig. Gen. Bautista said. “With wider practical experiences to understand and appreciate the importance and relevance of concepts inside the classroom, the activities are scheduled to provide the participants with new familiarities and opportunities to grasp peaceful environments of the outside world,” Brig. Gen. Bautista said. The tour itinerary includes a visit to Malacanang Palace to meet and greet President Rodrigo Roa Duterte. The Mind Museum, National Museum, and Manila Oceana Park are also included in the schedule. Updates of the activities will be posted on #TeamTabak social media account at http://facebook.com/teamtabak.